All timber exposed to the outer cavity, except naturally durable species should be treated. SuperQuilt is applied directly from the roll either vertically or horizontally depending on the wall height, pulled tight and stapled onto the timber battens at minimum 300 mm centres. SuperQuilt should be overlapped at each joint by approximately 50 mm and stapled onto the battens, the joins should be sealed using 75mm YBS Foil Tape. 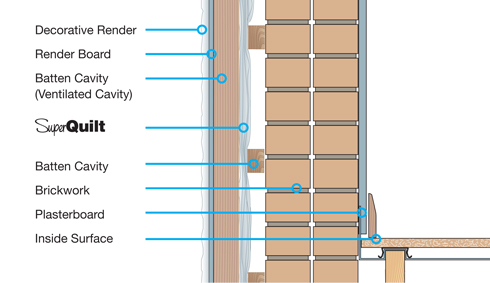 Vertical battens, recommended 25 mm by 38 mm are fixed to the vertical battens; battens should always be placed at the top and bottom of the wall and around the perimeter of doors and windows. The carrier board is fixed over the product and onto the battens, the external rendered finishing should comply with BS EN 13914-119. 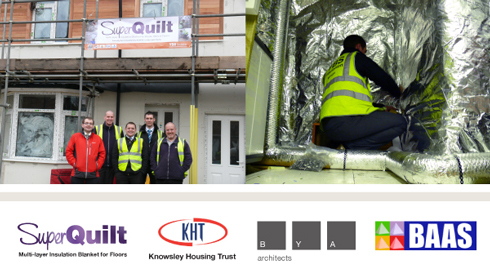 Over the last 6 months YBS Insulation and Knowsley Housing Trust have been working closley together on a project in Liverpool. The project has been developed to find an environmental and technological model that improves the UK’s goal of cutting emissions by 80 per cent by 2050. 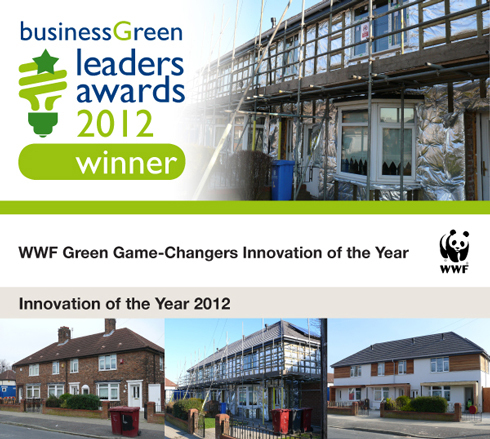 The award, presented in association with WWF, aim to recognise the top green business innovation of the past year. The judges were looking for technology that promises to prove a real “game-changer”. The winners demonstrate a unique technology or service that challenges current business thinking and promises tagible and significant environmental benefits.